A city in western Iran, located in a productive farming region. The capital of Hamadan Province, the city is known for the manufacture of rugs, leather trunks, ceramics, and copper ware. It is the center of the Iranian shellac and leather trade and is commercially important because of its position on the principal route between Baghdad and Tehran. 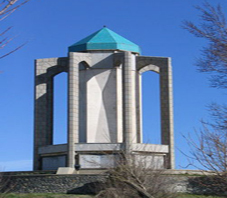 The city of Hamadan has a number of bazaars and several mosques. Also in the city are two tombs of special interest, one claimed to be that of the Biblical Mordecai and Esther, and the other that of the Islamic philosopher-physician Avecina. The city is believed to occupy the site of the city of Ecbatana, capital of the ancient Medes. During World War I (1914?1918), Hamadan was the scene of fighting between Russian and Turk-German forces. The city was held at various times by the Russians, the Turks, and the British before being restored to Iranian government control in 1918. The town's places of interest are: Avicena's tomb and Museum, tomb of Baba Taher (Iranian mystic and wandering dervish who died in 1019 A.D., and Ganjnameh, Hamadan's oldest Achaemenian rock carvings consisting of two huge inscribed panels (twenty lines) carved on two rock faces of some two meters in height, located 5 kin. west of the city on the slopes of Mount Alvand. 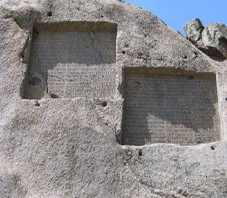 The Achaemenian Ganjnameh (Treasure Inventory) is a lengthy inscription in cuneiform script, composed in three parts (in Old Persian, Elamite and Babylonian) and carved on the face of two rocks of some two meters in height, on the mountain Alvand. These twenty-line inscriptions, belonging to Darius I and Xerxes, consist of a genealogical account of the Achaemenian monarchs and the adoration of Ahura Mazda. Here is the translation of the text concerning Xerxes: "The Great God Ahura Mazda, greatest of all the gods, who created this earth and the sky and the people who gave happiness to the people who made Xerxes king an outstanding king among many kings, an outstanding ruler among innumerable rulers; I (am) the great king Xerxes, king of kings, king of lands with numerous inhabitants, king of this vast kingdom with far-away territories, son of the Achaemenian monarch Darius." 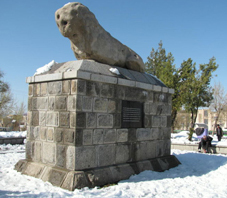 This stone statue of a lion has been attributed by some scholars to the Median period, by others to the Achaemenian era, and still by another group, to the times of the Parthian rulers. The statue is about 21/2meters in length and I 1/2meters in width, and it now rests upon a stone base provided for it in 1949 A.D.